Most of you know about my deep love for the little delicate black cat with the red scarf, Jenny Linsky. Esther Averill's creation is a dream come true for read aloud families around the world. But, what I wasn't aware was that Jenny Linsky was merely the tip of a read aloud phenomenon. Averill's Linsky and Cat Club books are classics that are fabulous for reading aloud to the very youngest kids, but also to teens. Some of the books are still to complex for reading aloud to my twins, while others are accessible to three-year olds. I was surprised by how "diverse" this collection of books is, but how tightly knit the stories are! As a collection they retain their "read aloud value" for a long time. Oh yes. I knew that Jenny Linsky was a star. But I didn't know half of it. The story of Jenny Linsky is not a story of a one-hit wonder with a quirky back-up band. It is an inspiring journey of personal growth that you can take with the Cat Club. The Cat Club is a the story of a jaunty, metropolitan (dare I say jazzy) group of around a dozen neighborhood cats in Little Old New York that includes among its members the city tramps Sinbad and The Duke, elegant Persian cat Madame Butterfly, the high-stepping Macaroni and the Winston Churchill-like Mr. President. Averill's talent is such that kids will automatically identify with Jenny's attempts to break into this "close-knit society", but what I adore about the books is that Averill had the great sense not to make all the neighborhood cats members of the Cat Club AND she did not make all the books about Jenny! One of the Cat Club outsiders is the incredibly heroic and valiant Pickles, the Fire Cat, who helps Jenny recover her scarlet scarf in the first and best known book Jenny And The Cat Club. Pickles is one of the neighborhood cats that is best adapted to life in the city, in the sense that he is not a mere pet. He is the mascot of the local Fire Department and he he actively joins the firefighting crew in their day to day activities. Not surprisingly, my daughter and my son were bowled over by images of Pickles in his fire helmet and his bravery in putting out fires. We came across Pickles in several of the other Cat Club books that were republished by the New York Review Children's Collection after they went out of print, yet I always knew that my twins felt a void. But we never came across an explanation about "who was Pickles?" and how did he become a fire cat. For a long time I was as confused as my kids were. Until one day, I happened to discover this little gem. You should have heard the screams of joy in our house when it arrived! 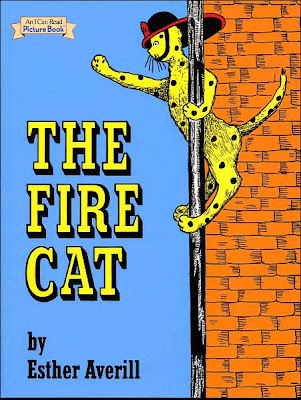 What I love about The Fire Cat, is that it is not a mere picture book. This is a powerful anti-bullying story, but not a preachy story, mind you. It has an air of nonchalance, but behind the charming illustrations lurks a story as powerful as any classic. And it begins as perfectly as a children's book can start. With a "Once upon a time... "
We get to know Pickles - but not as the hero as we know him in Jenny And The Cat Club. Oh no, here he is a young, brash and idle cat. A cat with too much time on his hands and no occupation. He lives in a barrel and as he had nothing to do, Pickles decided to become a bully and he chased little cats out of the yard. Pickles knew that this was a bad thing to do, "but he had nothing else to do". The illustrations are as charming as in Jenny and the Cat Club and they convey the futility that young Pickles must have felt living alone in the yard and with so much time on his hands. Fortunately, Pickles was an extraordinary cat that had an extraordinary friend in the form of Mrs Goodkind who recognizes his potential and turns his life around by telling him the truth as it is. "Pickles, you are not a bad cat. Then you will be good." Mrs Goodkind recognizes that Pickles's anger is merely a reflection of his isolation, idle life and lack of love, so after an unsuccessful attempt to adopt him as her pet - she finds an even better solution. Kids will immediately identify with Pickles's wishes to do something grand in his life and to earn the respect that he yearns for. Pickles is a cat who wishes to do big things. So, he is taken in by the Hook and Ladder Co. and he becomes a fully-fledged member of the fire department and its mascot. To change his life around, Pickles had to change his ways. Redemption does not come easy and it is a lesson well learned. Finally, the ultimate lesson that Pickle learns from the Fire Chief is that he must be good to other cats and the story comes full circle. At the very end, Pickles climbs the same tree where he once chased up a little cat - but this time he comes as the Fire Cat to save the new cat. The story doesn't end here. Even though the reader would think it should. No, Pickles is not the "full circle" type of cat. This is only the beginning of a marvelous character in children's literature. This is one collection that will mark the childhood of any child, girl or boy, thus making the 13 stories (or half a dozen books) of the Cat Club collection a sound investment. I knew about Pickles for years, but never knew anything about Jenny and the Cat Club. That's where my incorrect guess came from on last week's KitLit question...thanks for turning us on to Jenny and the Cat Club. Looking forward to reading it. So glad you will give Jenny and the Cat Club (preview http://amzn.to/X5CFf3) a try! The book is simply fabulous. We are currently reading Captains of the City Streets (http://amzn.to/YbeAka), its a prequel and most exciting - but I feel it is better read a bit later than the books I mentioned, and even after Jenny Goes To Sea (http://amzn.to/WveJCD). Of course, this is just a personal preference and in reality, any order is suitable as long as you enjoy it! 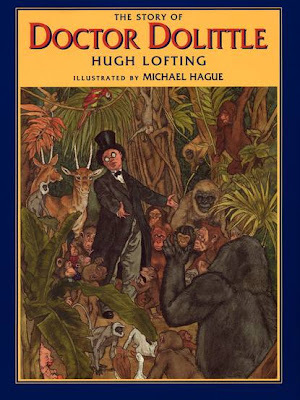 This was one of my daughter's favourite books as a child (she is now 38). She never grew tired of it and we read it together many many times. I was delighted to see it here. I wonder if she still has it? Yes, kids never grow tired of this book! It's got that timeless magic. I wonder what your daughter would say if you asked her about it!? How does she remember it today? Please do let us know if you ask her about it! I think I remember this book from my childhood decades ago. It's old, right? Oh I remember that book from my childhood too!! (I'm 36 now). I haven't heard of it for years, but I remember liking it. I never heard of Jenny and the Cat Club though. Will have to check that out for reading to my girls (ages 6.5 and 5 yrs). Pickles, the fire cast - a blast from the past! I'm glad that you liked the book , but don't say I didn't warn you:. Jenny Linsky and The Cat Club will make your girls crazy about the entire series. It is a fantastic book series, classic and urbane. So classy and perfect for reading aloud!